OUR CHRISTCHURCH FELLOWSHIP PROGRAM STARTED ON MONDAY JANUARY 23RD, 2017! MEET THE AMAZING #UNSCHOOLNZ COHORT OF EMERGING LEADERS, CREATIVE REBELS AND CHANGE AGENTS, JOINING US IN NEW ZEALAND FROM 8 COUNTRIES! Charlene is fascinated with how the world is becoming progressively more integrated with technology. She is seeking ways to diversify and upgrade her breadth of technology related skills and knowledge in order help find effective efficient solutions to the big complex problems we have today. Her goal is to find ways for technology to improve education, nature and processes in everyday lives. Currently studying a Bachelor of Engineering in Electronic Computer Systems Engineering [Mechatronics], Charlene is vibrant, curious and loves learning about people and how to make their lives better! Esther Whitehead is a dedicated change-maker, through both policy and community engagement. Esther lives and works in Queenstown, and works passionately in the fields of special education reform and environmental sustainability at both a local and national level. Esther provides workplace consultancy in the area of diversity of learning, and with a fellow trustee designed 4D schools, promoting: Get it Right for Dyslexics – Get it Right for All. Esther is the co-founder of The Anti-Plastic Population, a local group which backs sustainable businesses and acts as a change-agent through encouraging and developing community cohesion. A keen writer, Esther produces content on special education for Ministry of Education and the Dyslexia Foundation, as well as publishing monthly articles on environmental sustainability in The Source Magazine, and regular articles for Te Awa Green Party magazine. Esther holds an undergraduate degree in Ecology from the UK, and a post graduate degree in Special Education from Massey University, NZ. Esther is currently employed as the Managing Trustee of The Dyslexia Foundation of NZ, an NGO advocating for educational reform in NZ schools and workplaces. Born and raised in Berlin, Gina moved to Amsterdam to study fashion production. Disillusioned by the lack of ethics and sustainability, she moved into the branding course (arguably not much better). During five years in London, she honed her skills commercial consulting whilst volunteering for The Do Lectures (storytelling events in the woods) and Good For Nothing (social enterprise hackathons). On her return to New Zealand she joined the Enspiral network, a group of social entrepreneurs prototyping distributed ways of working, organising and decision-making. She's been part of the team leading the youth wellbeing Lifehack for the past three years. Jasmine wants to live in a world where everyone lives sustainably, isn't afraid of but embraces change and diversity, and where there's unlimited coffee and puppy cuddles. She's currently in the corporate world trying to convince her clients that doing business sustainably is a win-win-win for people, profit and our planet. Ultimately, she would love to run her own social enterprise. Jessy lives in Oakland California and is a self-proclaimed eco-comic and sustainability nerd with a love for renewables. Her background includes multimedia communication, project management, sales and training. She earned an Environmental Policy degree because she believes climate change is no joke and went on to complete an MBA to be a #nastywoman in the old boy's network. Right now she is developing her game Climate Oasis and working on her consulting & comedy. Kareena is originally from Christchurch, NZ, and moved to Wellington when she was 12. She studied Graphic Design before stumbling into the world of entrepreneurship with her company The Misprint Co. She loves working to turn waste paper from businesses and schools into good-looking notebooks and saving carbon emissions and water! Kareena is really enthusiastic about social enterprise and doing business while doing good. KK sees herself as a futurist and a doer. She is passionate about building better futures, creating and up-lifting potentials to enhance wellbeing and curiosity in communities. She comes from a health sciences background with a master's in public health. KK believes that change comes from within and that by providing people with the tools and choices necessary, people and communities can be empowered to activate change for the good. Laura is proud to call Christchurch her home and to be part of its renaissance. Big ideas and creativity have always been part of her life. She is a practical idealist - an improve-aholic, fascinated with complex systems and finding ways to make things better for people, cities and the environment. Growing up in the country under big skies with giant planes heading to “The Ice” has given Laura a deep sense of guardianship for the Great South, and led her to graduate in soil ecology and Antarctic studies. Her passion is in learning how people participate in the public realm --- the “shared living room” --- of the city and take responsibility for it. As a placemaking advisor, parent and global citizen, Laura thinks it’s really important to reflect on our legacy and how to create lasting change that keeps rippling good outcomes? Louise is a landscape architect from Melbourne Australia, with a background in the design of large scale infrastructural projects and interdisciplinary collaboration. Louise's love for traveling and outdoor adventure has fueled her passion to create sustainable cities, challenge societal apathy and affect positive social change. She has a Masters degree from The University of Melbourne in Landscape Architecture where her thesis explored the sociopolitical context of Melbourne's waste crisis. She designed a strategy to decrease waste generation and harnessed NIMBY opposition to a new landfill to challenge apathy and create positive social and environmental change. Fascinated by the city and it is systems, Louise sees the urban environment, its people and their behaviours as crucial in tackling climate change. She believes that design has a responsibility to challenge conventional thinking and provide alternative visions to the world’s wicked problems. Louise is currently researching the connection between disruptive digital technology and the built environment. She aims to harness problem centric, agile and innovative approaches employed by startups to create human centred design solutions that can create positive environmental and social change in cities around the world. Lucie, from New Zealand, has a background in corporate sustainability and law. She has an LLB (Hons) and a BSc, specializing in environmental science, both from the University of Auckland. In her current work on sustainability within business, Lucie is bringing together her experience from a broad range of energy and environmental legal matters with her recent experience in strategy and transformation. She is interested in the application of design thinking both in and to businesses, to effect change. Lucy completed a Bachelor of Fine Art at the Queensland College of Art and worked in the arts for 15 years in Australia, UK and Germany. After successfully implementing a cultural change at an artist collective in Melbourne, she moved into corporate change management and completed post graduate studies in Organizational Change to increase her understanding of how to analyze and manage change. She currently works in business transformation strategy in the utilities sector. Lucy’s career/ life goal is to be involved in influencing cultural and social policy to build a more sustainable society in Australia. She loves the challenges of planning for change and increasing people’s ability to change. Nidhi is a designer by day, and data visualization enthusiast by night. She likes to bridge information gaps, through digital and print media, and also likes to explore the boundaries of interdisciplinary design and learning from others. Nidhi was born and raised in Allahabad, and spent her childhood traveling all over northern India. She studied at the National Institute of Design for Undergraduate Studies, specializing in Graphic Design and exploring other branches of visual communications. Her passion lies in information design and data visualization, especially visuals that talk about everyday life. Currently Nidhi works at a startup that applies technology to logistics, an industry that stretches the country's inefficiencies in its present form. She is also working on her own venture, a web and print platform for users to talk about their surroundings, social issues, and experiences. When she finds some spare time, Nidhi enjoys reading, illustrating, taking online classes, and running. Paul is the Founder and Chief Go Getter of a charity called OKE Charity, an organization that aims to “grow mighty kids” by achieving an initial goal to get every primary and intermediate school in Papatoetoe to grow their own fruit & veggies by 2018, learning essential life and social skills in the process. With a background in project management, and business efficiency and effectiveness, Paul began his career in the automotive and power generation industries and he has worked in a number of countries around the world for large multi-nationals. While working in the power industry in New Zealand, Paul became increasingly frustrated with the lack of positive relationship building and the “do as I say and don’t ask questions” attitude within his professional community. He decided to make a professional change to use his flair for the unconventional and organizing to make things happen and created OKE Charity and its main fundraiser, the Head2Head Walk. OKE Charity has six Papatoetoe primary school gardens yet to establish in order to reach its 2018 goal, and Paul is committed to deliver. Philippa is a 26 year old from Dunedin, NZ, but spent the first half of her life in Zimbabwe. She has studied both Nursing and Visual Arts, and has a wide variety of interests including sewing, writing, dance, cooking, illustration and design. Philly’s passions tend toward social change, justice, community health, and increased education and opportunities. What excites her is seeing ideas come into fruition, and seeing people's gifts emerge with growth and encouragement. She wants to work with people, creativity and change. Rochelle is passionate about growing resilient communities in Aotearoa which showcase innovative solutions to the big problems facing our globe. Co-founder of Love Local (www.lovelocal.org.nz), a charitable business with a focus on making affordable, locally grown produce available to Invercargill families, Rochelle wants to see growth in social enterprise, where businesses are designed to benefit communities rather than to simply make a profit. In her work as a facilitator of family violence prevention programs, Rochelle uses her skills to motivate people to make positive change in their lives and relationships. As an artist, adventurer, change facilitator, and life coach, Samantha believes that creativity is the key to unlocking our humanity and that as life become more automated, humans become more disconnected from themselves and the world around them. Samantha stepped away from a legal career to help people reconnect to their inner spark. She designs creative learning challenges - whether in the bush, the office, around the kitchen table or a super comfy chair - that enable people to reconnect with themselves and their world. Observing that business leaders also struggle with this disconnection, her consultancy, More Human, helps leaders step into the shoes of the people in their ecosystem, to design and build organizations driven by human-centric values. Stephen has been self-employed since the late-80s, moving around the world with his work and seeking out opportunities to make a sustainable difference within large organizations. His world-changing passion is to rebuild organizations from the bottom-up blending classical (non-violent) social anarchism with the best research on hierarchical structures. He seeks to ensure organizational change is safe and does no harm: to the people involved, to the environment, to the organization itself. He met his French wife in Angola while they were both working for the Red Cross and they’ve been in NZ since 2004. Born and raised in New Zealand, Stephen studied Visual Communication Design in Wellington before completing a six month internship at Amnesty International in Auckland. Currently he is expanding his skill set in the market research and customer engagement field. His aim is to be a cross-disciplinary professional with skills in design, research and sustainability and to bring those skills into the fight for human rights in NZ and around the world. Meera is currently rethinking and redoing everything that she didn't get to decide as a child or do when she was younger, including deciding to contribute towards creating a sustainable planet. She is a sustainable development and living enthusiast who enjoys reading, writing, art and speaking. Ready, set, go! The Christchurch fellowship kicked off on Monday afternoon with a buzzing cohort of 20 fellows from 6 different countries. Bec, our city host (and UnSchool Alumni from the inaugural NYC fellowship in 2014) gathered us in the central city at Te Pou Herenga a Waka, a stunning installation that symbolizes bringing people together – an appropriate starting point for the collective journey our fellows are about to embark on. After a brief overview of the city and program, the walking tour began with Bec and our co-producer, Nita, at the reigns. The tour highlighted innovative interventions that have been established in the central city post after the major 2010 and 2011 earthquakes, including the ReStart Mall and Arts Centre. Our final stop was conveniently our first home base for the week, ArtBox. Once we arrived at our ArtBox, we jumped straight into getting to know everyone’s name and an insightful fact about them, by playing the UnSchool's signature kick off game, the One Legged Stand, which uses a little bit of cognitive magic to make the new information stick. With 20 fellows and 7 team members all standing on one leg, the challenge of having to process cumulative information in a physically uncomfortable situation proved that the magic trick worked - the group nailed the names and facts. Even Leyla made it around all 26 with only some slight confusion (for the first time she was challenged by a fellow to remember everyone's names and facts!) . Then we dove straight into our mini Pecha Kucha intro sessions, with each fellow and team member having 3 minutes and 9 slides to tell us their life stories, passions and everything that floats their boats. Next, we rolled straight into a deep sustainability discussion, led by Leyla, and a series of group conversations about how we can achieve sustainability globally. Some great views were shared collectively as we teased things out. After we wrapped the session up, we set off on an adventure around the central city. We stopped by a gigantic interactive arcade game and wandered on to meet Peter from Anteater, who had a surprise mid-walk snack to satisfy any rumbling stomachs: native farmed locusts, seasoned with garlic and chili. Even the most skeptical of fellows were amazed at how delicious they were. We powered on, taking a moment to check out the 185 Chairs installation, paying respect to those who lost their lives in the February 2011 earthquake. We also explored the ‘Cardboard Cathedral’ designed by Japanese architect Shigeru Ban – it was inspiring to see the way materials can be used in innovative ways, and how Christchurch is designing for adaptive use in unique ways. The most exciting interactive moment we shared on our first jam packed day must have been at the ‘Dance-O-Mat’, a large-scale pop-up dance floor in a repurposed space. When you pop a $2 coin into the old laundromat machine and plug your phone in, music flows through loudspeakers and you get to boogie it out in public on the dancefloor. It was the perfect opportunity for fellows to shake off the day and get their groove on (as you can see by the photos, we had a load of fun - get it?). As our downtown city walking tour was drawing to a close, the fellows and team were happy to arrive at Thai Box for dinner as the group had worked up an appetite from all the greeting, talking, walking and thinking and dancing! This new restaurant reflects how businesses in Christchurch have been re-established through innovative architecture. With some delicious food, a glass of wine (from one of our awesome partners, Peter Yealands!) and bellies full, we called it a night after our busy first day of #unschoolNZ. Day 2 kicked of with a healthy shared breakfast, and a caffeine boost thanks to Sherpa Coffee and Nature Matters Milk. As per UnSchool tradition, fellows and team members then took turns sharing something special that they had brought from their hometowns, ranging from songs to sweet treats, Californian beer and a jar of 140km/h wind! The team turned it out! This was followed by a chat with Mark McEntyre, senior Design lecturer at Ara, who helped establish our home base, ArtBox. The modular space was developed to create change, evoke community response and explore new ideas after the Canterbury earthquakes. Like clockwork, we flew straight into a systems thinking session. With the fellows already having some systems knowledge under their belt (thanks to the online classes they took before joining us for the fellowship), we were able to go straight to the nitty gritty of understanding complex human and regenerative systems. After absorbing the key points, fellows broke into groups to cluster map their view of an education system, discovering hyper-cluster points and sharing their insights with the group. That felt like an appropriate moment to pause and refuel – before we ‘wreckity-wrecked’ ourselves. We shared a picnic lunch of delicious salads in the sun, and were able to quench our thirst with some Karma Cola. Hungry for more (information that is), we turned to our first guest mentor, Nick Gerritsen – and he definitely satisfied the fellows' appetites. Speaking about his background in radio among other ventures, one key message was “if you get your audience right, you can compel them to change”. Nick shared so many gems with everyone, it is impossible to document them all. The fellows were absolutely buzzing from this session. Before Nick set them off on a group challenge, he left us with “you as individuals can all change the world.” That’s what we are here for, right? Our final guests for the day were from the Live the Dream Fellowship, a 9-week social enterprise accelerator program in New Zealand. 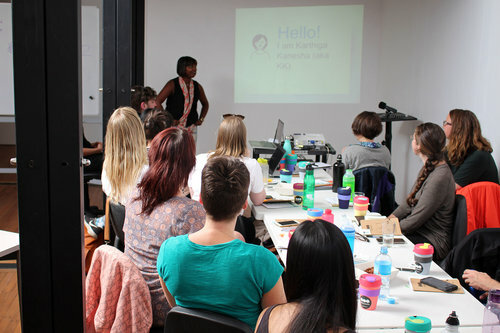 Fellows of that programme, Tia and Tane, ran the session. Their primary focus was to reconnect disengaged Maori youth with their culture. After describing the four pillars of Whare Tapa Wha, a traditional Maori health and well-being model, conceptualised through the essential cornerstones of a whare (house) and based around hinengaro (mind), tinana (body), wairua (spirit) and whanau (family), Tia and Tane threw it out to the crowd to see what our values were. In groups, fellows presented their key values, some of which were showcased with more songs (bring on UnSchools Got Talent?). Tia and Tane closed their session with a traditional haka that captivated the room. To wind up a long day, fellows were given not one, not two, but three tasks. We ended with co-host Craig’s reflection session ‘Brain Food’. Fellows responded to question cards that asked things like “What I am hungry to learn more about?” and submitted their cards into our “brain box”. At the end of the activity, we tossed around and gobbled up a pretty fresh UnSchool salad. Speaking of salad, it was time group fellows together and send them off too some great dinner locations around Christchurch. Before leaving, fellows were handed an envelope - surprise challenge time! ...Stay tuned to find out what our UnSchool fellows come up with! We switched up our venue for Day 3, starting off at YMCA’s Papa Hou - Treasure Box. The stadium space has been developed as a stop-gap due to the lack of arts facilities in the city, and it was a perfect location for the day. Fellows gathered outside before we led them upstairs, where a scrumptious homemade blueberry pancake breakfast awaited them (Pancake breakfasts are an UnSchool tradition – Natasa was our pancake extraordinaire this time, and she did not disappoint!). While devouring the delicious spread, and powering up with some Sherpa Coffee, the fellows showed us the results of the previous evening's dinner challenge. Fellows had been tasked with discussing a series of questions, which lead to the surprise that they had to pitch themselves as superhero teams, using their individual and collective change-making abilities to make the most dynamic range of super powers. Too much happened to explain it all – but it included rapping and telekinesis. Our first mentor of the day, Raf Manji, shared his take on the iceberg model - while the bit on top highlights the immediacy of the present, there are still so many interconnected systems happening underneath the surface that go unnoticed. Raf suggested we find the achilles heel of the system, to try and get inside and change it. Leyla then guided us through a whirlwind experience in gamification and game theory, relating it to the way in which we strategize to make change. The fellows asked a few too many excited questions as we packed up and headed off on a little walking adventure to our secret lunch location. We were treated to an incredible, well deserved after our sunny day walk through the park to the soon-to-be-opp[ened Gatherings restaurant. 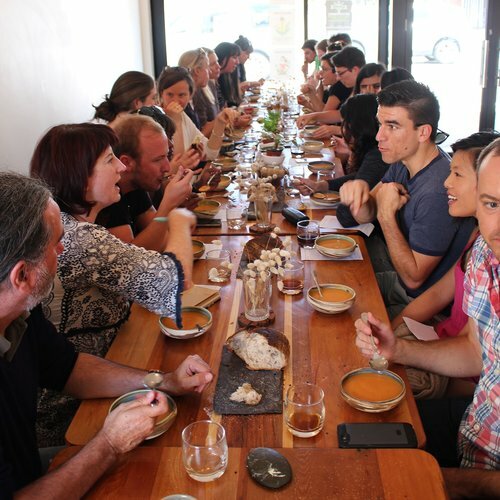 We had the honor of being the first group to share an incredible vege-centric lunch in the intimate space. The owner and creative mind behind the Gatherings concept is Alex (who despite not being able to join us, left a beautiful note explaining the concepts of locally sourced vegetable-centric food). His brother Jo, was our host and chef for the day and after being served a warm coffee and reading Alex's note, we were invited to break the bread as a celebration as the first guests, fellows and team tore and heartily shared out the local sourdough before bowls of beautiful fresh summer gazpacho arrived for us to devour. We all then enjoyed a lovely walk abck to the YMCA along teh park, discussing all manor of fasinating things inspired by our healthy planet-friednly lunch and by the inspiring day so far. After lunch, we were joined by Jennifer Whitty, a sustainable fashion researcher from Wellington, who guided the fellows through climate impacts and changes in relation to consumption. Fellows brought along one garment they love and one they don’t wear often, and discussions ensued around ethics (there was some unavoidable style commentary too). Next up was an interactive experience from Fi (a Melbourne fellow alumni), who explained her alter ego Senorita Awesumo and her experience with sustainable fashion using zero waste techniques. She wowed the fellows with her interpretation of zero waste. Fi prepared a magic box of textiles, destined for the landfill, for fellows to reimagine. They were challenged to create a series of upcycled products which they presented back to the group after just 45 minutes. Everyone was impressed – despite the long day, creativity flowed and ideas focused on the opportunity, not the problem. After the quickest clean up you have ever seen (because the YMCA was booked for a dance group) we progressed to a sunny park experience where Craig led a session on the jam-packed experience, with pairs of fellows sharing their joint top three highlights of the day. Closing out with the tune of bagpipes randomly joining us, we talked about the adventures we had all had. As the sun set, we made our way over to The Gym, not for fitness, but for a surprise dinner party. The rep from Yealands wine, who is generously covering our wine for the week, shared amazing things about their business, including stories of regeneration and sustainability, and also told us about babydoll sheep (look ’em up!). As the fellows were learning all about Yealands, the team was working behind the scenes and pulled off a home cooked meal for 30 people, which seemed to just magically appear in front of us. As we played the secret dinner party game, evilly or brilliantly designed by Leyla, we uncovered the tactics and tools that we covertly use to influence the people around us. The game and the discussion that followed were both hilarious and insightful. As we started to wind up the event, we reflected on the long and deep thinking day. And yes... it is only day three! Day 4 started off with a beautiful breakfast at XCHC's cafe, which prides itself on locally sourced seasonal food. The Operations Manager, Preston, spoke to us about XCHC, a startup space for the creative industries, and how it incorporates both sustainable and regenerative practices into its business. Next up, we chatted with Brie from The Ohu Project and Juliet from ReKindle. The fellows were eager to learn more about the unique approaches these organisations are taking to rebuild Christchurch in a sustainable and ethical way. After our bellies and minds were full, we headed to The Commons – a welcoming, ever-evolving community space that connects people to the inner-city and to each other. We took to a makeshift grandstand, where we were joined by Ryan Reynolds, the co-founder of Gap Filler (the crew that created the Dance-o-mat and arcade game we played with on the Day 1 walking tour). He led us on a fascinating exploration of community engagement. Riveted by our morning of unique guests, fellows chatted about the resilience of Christchurch, under the trees on the Avon riverbank. After eating a hearty lunch and quenching our thirst with some Karma Cola, Leyla led a session on the power of research – aka curiosity in action – and how we can use it in more effective ways. Splitting into 2 groups, fellows were given an observational research challenge. Short for time, we jumped in Green Cabs and headed to the suburb of Spreydon to the start our afternoon session. Groups were challenged to apply the research strategies they had just learned in a real world setting as they went off to speak with local community members from The Court Theatre and ECAN. Back at ArtBox, our homebase for the week, Leyla was eagerly awaiting the arrival of the fellow groups with their new strands of community knowledge. She laid out a huge piece of paper for the groups to start mapping systems and landscaping the connections. After a final talk with Ben from Banquer, it was time to call it a day... Almost. Of course, we couldn’t skip Craig’s reflection session! Fellows chose the word that resonated with them the most from this list: intervention, repurpose, perspective and observation. Collectively discussing their choice and writing statements about why, fellows then chose the word that least resonated, and responded to it. We wrapped it up by describing the day in just one word. And that was a wrap for Day 4 – fellows were given a free evening to process everything that has bombarded their brains so far. Day 5 of #UnSchoolNZ started off at our homebase, ArtBox, with a brilliant breakfast and a (much needed) caffeine hit from Sherpa Coffee. UnSchool fellowship programs are intense, so our team always makes sure that everyone is fed, caffeinated and ready for the next session! Our pieces of brain food from Tuesday's reflection session magically reappeared on the walls of ArtBox (thanks to Craig). Fellows digested the brain food (and real food) over breakfast, reflecting on their journeys so far – funny conversations inevitably ensued. After breakfast, we had an incredible morning session with our guest mentor, Rebecca Mills, a sustainability innovation specialist. She kicked off her session with a focus on “new ways of being and seeing, and practical innovation methodologies to create a more beautiful, equitable world”. Rebecca told us about the five things she believes someone needs in order to be a successful changemaker and her “jump up and jive to transformation methodology.” As the morning unfolded, she set a selection of group tasks, such as putting measurements in place to create your ideal world. With her help, fellows worked on applying the concepts she presented in a tangible practice approach. Rebecca's session beautifully tied things together, as it illuminated how all the concepts we have been exploring this week can be applied to real-world scenarios. Making the most of another sunny summer day in Christchurch, we enjoyed a picnic lunch (this might be the most picnics we have had in a single fellowship so far), fueling up on an amazing variety of healthy goodness, including a freshly picked green salad from co-producer Nita’s own garden. Everything really hit the spot and the fellows were charged for Leyla’s final session for the week. Leyla took fellows through a crash course on the disruptive design method and then unpacked other concepts and arenas that would help equip fellows for the last important part of the UnSchool fellowship (spoiler alert... the 24-hour challenge!). Reading the room, she shared her wisdom on systems mapping, life cycle assessment, disruption, problem-solving via problem loving, and procrastination as a tool for motivation (this led to an ‘ah ha’ moment for many!). Putting systems mapping into practice, the fellows dived into a connected circle mapping exercise focused on guns and law (their choice, not ours!). Clusters of chaos were created. The session continued into the late afternoon with Leyla’s ten golden rules of ideation and, by the end of it, our UnSchool notebooks (cover designed by our fellowship intern, Megan, and printed by The Misprint Company) were bulging with incredibly useful information and ideas for making change. Fellows were then challenged to pour their creative juices (which were really flowing at this point) into an ideation session focused on guns. 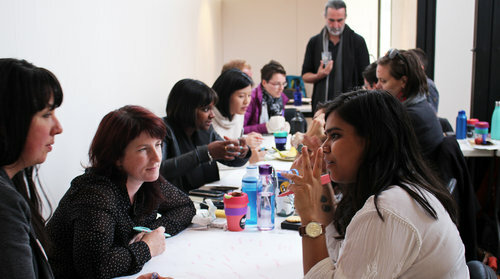 With the systems mapping they had done earlier laying a foundation for all the nuanced connections around guns and law, fellows dove in, thinking up ideas for creative interventions. After everyone pitched their ideas, we rounded it off by playing an empathy game, which Leyla used to demonstrate the application of the Disruptive Design Method in action. After the game, fellows hopped into a reflection session with our fellowship co-host, Craig. This time it was focused around four symbols (brain, eyes, hands, heart). Each fellow had to choose one symbol that they wanted to reflect on and share their thoughts with the group. Craig even themed his outfit, wearing his symbols cardigan! Just as they thought the day was done and dusted, we had a little surprise for the fellows… the announcement of the 24-hour challenge! Fellows were put into teams and given the first clue about the challenge: their client would be the Christchurch City Council. UnSchool Team members, who had already participated in a challenge like this, shared some insights on how to effectively collaborate within the team challenge dynamic, and, with that, fellows were sent off to eat dinner and prepare for the two days ahead. The actual challenge will remain a mystery until 9AM on Day Six…. Check back to see how it all unfolds! Day 6 snuck up on us so quickly! And if you're familiar with our fellowships you know that Day 6 means one thing... the Design Challenge begins! For our 24-Hour Challenge, fellows team up and work together, apply all that they have learned and uncovered during the week, to address a client's design brief. We kicked it off at our challenge home base, BizDojo, an excellent brand new co-working space in downtown Christchurch. We arrived to the beautifully bright and clear space early, allocated work rooms for teams and then gave fellows the challenge brief, which they digested over a nutritious homemade breakfast. Fellows were excited by the challenge brief, developed in collaboration with Christchurch City Council (CCC). The brief outlined a problem statement, location context, considerations, parameters and supporting information that the fellows could work with while applying the Disruptive Design Method to explore how to develop creative change interventions. The CCC challenge outlines a quest to create a circular economy vision for Spreydon in Christchurch, a community suburb. Their goal is to achieve a circular economy by 2050, which would, in turn, allow for a rapid transition to a “one planet” city. Currently, Christchurch is a minus five planet city, and thanks to the great work of the CCC, there is a strong desire to find unique ways of becoming a planet positive place! Each team was given an opportunity to ask questions to guest speakers – Phil Clearwater, CCC Councillor, and David Boothway, CCC Strategic Asset Planning Manager – to mine out as much additional information as they could before they tackled the complex problem areas at hand. David summarized the issue with this great quote: “We don’t have a pollution problem, we have a design problem.” David and Phil demonstrated their passion for the city and it’s future, and it was incredibly valuable for our fellows to share time with them. After the question session closed, and fellows set off to get to work on the challenge! Teams jumped straight to it, and the walls of each of their rooms were hit with an explosion of systems maps. Lines and connections were drawn in all directions as they began to tease out leverage points. Teams put the first two phases of the DD Method into practice as they mined out the problem elements and systems mapped the identified elements in order to landscape the potential intervention points. Leyla and Bec went around helping agitate the thinking of the groups, pulling together strands of ideas and helping the teams think through dynamic and complex systems interventions. They reminded people to think about the big vision and the tangible micro interventions that will help build it over time. Leyla then jumped into the kitchen to help prepare a delicious dinner using the giant silverbeet brought in by our local team member, Megan. The mood was surprisingly relaxed but, as the evening progressed and Leyla's review sessions approached, groups started to push themselves through the rapid ideation sessions and got ideas flowing. Late at night, the UnSchool team went around checking in with each group before packing it up for the night. First thing in the morning, teams had to deliver a practice pitch of their proposals. While things had started to take shape, there was still a lot of work to do. Leyla helped teams illuminate gaps in their propositions and provided fantastic feedback on how to create strong narrative presentations that paint the vision of possibility in the judges' minds. The 24 hours were up in a flash and it was time for fellows to pitch their concepts to a friendly judging panel, made up of mentor Rebecca Mills, the Chief Financial Officer to Christchurch City Council, Carol Bellet, and Councillor Phil Clearwater. Presentations on how to intervene and lead Christchurch to become a one planet city included using insects laundromats and beer. Yes, teams took on the disruptive design concepts and turned them into amazing propositions of how to change communities, design eco systems services and facilitate mindset change for healthy communities. Before marking the end of presentations with the popping of champagne, the UnSchool team had one final surprise. Throughout the week, the fellows had been very vocal in making sure our team does everything they do, so we revealed that we had completed the challenge too! Our fellowship team delivered a presentation for a “One Planet card” systems intervention with gamified elements of civic engagement and ecological footprint reduction. .
We then cheers'ed with some tasty bubbly from Yealands and enjoyed a multicultural New Zealand themed lunch spread, covering a diverse range of cultures – from the very kiwi cheese roll, to dumplings, sushi, local cheese and salsa, all topped off with mini pavlovas. An impromptu dance party began and, after fellows got down to ‘Happy,’ we moved onto the final installment of ‘The Craig Show.’ For our final reflection session, fellows, in groups of three, contributed what they had learned, what challenged them, the most memorable moment, and a one-word description for each day over the intensive seven that we shared together. After the collective brain dump was over, Craig asked fellows to summarize the day and report summaries back to the group, reflecting on all the adventures and discoveries that were made this week. We then gathered in a circle and shared our closing thoughts with the group before we parted ways. There were tears, laughs and a gigantic group hug before fellows jumped on flights and bikes or headed to the pub for a final celebratory drink. ...And that’s a wrap for UnSchools Christchurch! Thanks to the incredible team, all our amazing partners, collaborators and sponsors and a BIG THANK YOU to our 20 fellows for joining the adventure and sharing their passion for making change. We're looking forward to having them in our global alumni community of creative rebels working to make positive change in the world. And that's a waap on another fantastic cohort, a bunch of incredible adventures and change in the making.